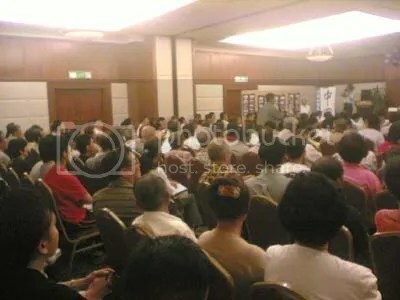 Cheras MP, YB Tan Kok Wai (of DAP) held a forum with the public on how to fight crimes, following a series of serious cases happened recently, especially the death of a TARC student.. The forum was held at Hotel Maluri, Taman Maluri, Cheras..Together with YB Tan Kok Wai is OCPD of Cheras district (I don’t know what’s his name), and a few others heads of department from IPPD Cheras, Taman Maluri.. 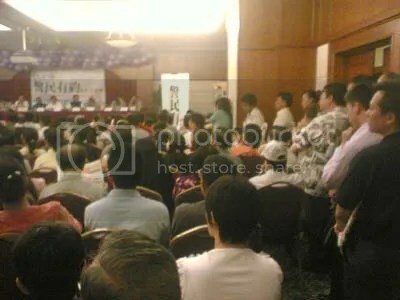 The forum was called Sesi Dialog Penduduk Bersama Polis, organised by China Press.. 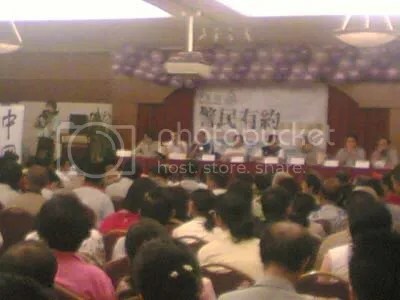 It started at 8pm..Most of the attendees were of middle age citizens til the retiree level.. The conference room was full and there were insufficient seats for the attendees.. Roughly the crowd made up of at least 85% Chinese, less than 10 Malays, and the rest were Indians.. According to the OCPD, crimes involving arms or dangerous weapons have rose for a massive 30-40%, recently.. The public were given a chance to ask questions or to share their experience or voice out their opinions on how to fight against crime.. The first speaker f*cked up, he was from Pandan Jaya, which is under Selangor, not Cheras..However, he was not stopped to voice out his opinions.. I dislike the second speaker..An oldman of about the range of 60-70 years old..
Albeit of my understanding of what he said, he wasted a lot of time in voicing out his cents.. Damn bloody long until everyone got bored..But, you know, he’s an oldman..So give some respect-lah.. The third speaker, I damn respect this aunty..She voiced out her problem in which initially seemed to be some public authorities misused their power to threat the civilians.. The third speaker was the highlight of the night.. This aunty, let’s call her Aunty..She operates a coffee shop with her husband somewhere in Taman Maluri, Cheras..
Last Thursday, this Aunty‘s car was parked on a meter-running parking lot.. Unfortunately, when she wanted to drive out her car, a car was double-parked on the road, blocking her car to move from that place..
To make the story simple, Aunty honked repetitively to alert the car owner of the blocking car.. The car owner, let’s call him Rela (because he’s a Rela member), was enjoying his coffee in the coffee shop operated by Aunty..
Rela pretended not knowing what was happening and refused to look at Aunty when she knew the car was his..
Then Aunty’s husband, let’s call him Hubby, talked to Rela politely to remove his car so that Aunty could get her car out.. So Rela hesitantly walked to his car..He stood beside his car and talked on his cellphone, for I don’t know how long..A couple of minutes, perhaps..
Then Hubby talked to Rela again, telling him to remove his car first..
Then Rela got into his car and continued on his cellphone (not sure whether he was really talking on the phone or just pretending to)..
Then Hubby knocked on the side window softly and made a hand gesture to tell Rela to move his car..
Rela got out of his car angrily, stomped on Aunty‘s car bonnet and punched Hubby in the face.!! Then a good old 70-years old Samaritan walked to the scene and told them not to fight on small matters..
Rela threw a punch on the Samaritan‘s head and caused the 70-years oldman nosebleeding (due to internal injury I suppose.??).. Aunty was in a state of shock, seeing all these while sitting in her car..Then Rela left the scene..Aunty, Hubby, and 70-years old Samaritan made a police report..
Later in the afternoon on the same day, 2 police vans stopped at her shop and handcuffed Hubby together with 4 other foreign workers (in the coffee shop)..
Then Aunty got to know about the incident and rushed the Balai Polis Cheras situated just beside Jusco Taman Maluri.. The police handcuffed Aunty too and put Aunty and Hubby in lock-up..But later got bailed out from someone.. So that’s the story from Aunty and asked where is justice.!! They were the victims, instead of arresting Rela, Aunty and Hubby were put into lock-ups..
Is enforcement units or local authorities such as Rela member can misused their authority power to do that to the public.??? After she had spoken what she wanted to, everyone cheered in supporting Aunty and jeered in insulting the police force..
Then..One of the police officers sitting in front explained the whole thing..
Head of Jenayah Berat Department or something, I’m not really sure but for sure he is one of the big ones in Cheras area.. He explained, Rela stomped on Aunty‘s car bonnet because Hubby kicked on Rela‘s car.. Thus provoked Rela to do the same thing and gave another ‘consolation prize’ to Hubby in the face..
Why Aunty, Hubby and 4 foreign workers were arrested.?? Because after Rela punched Hubby in the face, the 4 foreign workers came out of the coffee shop to help their employer, each of them armed with parang..
Then, Rela (or perhaps a forestry worker.??) took out an axe from his car and a brawl took place..Not sure any blood-spilling happened..
That’s not all..Aunty took out her steering wheel locker and smashed one of Rela‘s car window.. They were arrested beacuse Rela made a police report too..And to make things fair, Rela was also arrested and put into lock-up..
All of them were later given permission for a bail..This case is still under investigation..
You will read the same thing if you are a China Press newspaper reader..It was published in either Saturday (19-8) or Sunday (20-8) issue..
After that, there was no sign of Aunty sitting in the conference room..Perhaps, too embarrassed to face the crowd after making false allegations towards the enforcement unit.. The whole night, the police officers kept introducing Rakan Cop, which is actually a so-called organisation..
Rakan Cop Hotline operates around the clock..But do take note that Rakan Cop Hotline will only respond to emergency cases..
For example, you were robbed off your car at gunpoint..You call Rakan Cop..Give sufficient informations..
Rakan Cop will alert the nearest patrol car to the crime scene (which is where you are) and will be at your service as soon as possible (a suggested 15-minutes time, depends on the road traffic)..
Rakan Cop Hotline is 03-2115-9999..Or you can sms but I don’t know the number..Hahaha.. The forum ended at 11.20pm..Pheeew..What a tiring night..
Oh, my dad was one of the speakers..He too appeared on the paper..Hahaha.. Anyway..Give full co-operations to the cops and case will be settled in no time, hopefully..